Since The Door’s inception, our Arts Program has been central to our mission and is purposefully woven into our multi-layered support system to help ensure that all youth are connected to the full scope of services across our agency. We attract, engage and inspire all young people to reach their full artistic potential through an array of creative and professional opportunities. Youth develop an understanding of the critical role of art to promote self expression, personal creativity, healthy development, advocacy and leadership across a span of disciplines in the literary, visual and performing arts. The Arts Program runs on a three-block (or semester) cycle, offering a new selection of courses each summer, fall and winter. Each semester offers a wide range of programs that include “open” drop-in classes and “closed” intensive classes. You can participate at a level that fits your needs, interests and availability! Activities are held five days a week and are project-based to encourage active participation in developing, creating and executing an artistic idea from start to finish. There are NUMEROUS opportunities to showcase talents on site at open mic nights, spoken word sets and a final performance week held at the close of each semester. Through support of an expanding network of external partnerships, you can perform in various live art festivals, parades, schools and other community-based organizations throughout New York City. Non-performers can also gain production experience in the technical arts, including lighting, sound, costuming and marketing. Collaboration remains a key component of our Arts Program, as we constantly strive to improve and deepen the creative experience for all those involved. And best of all, it all takes place in a safe and supportive environment. Learn more about our expanded pre-professional Summer Arts Intensives! 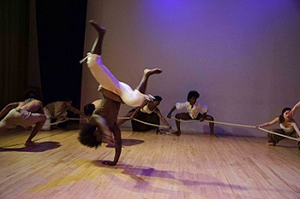 To learn more about The Door’s Creative Arts programming, contact Jadrien Ellison, Arts Supervisor at 212-941-9090 ext. 3346 or Anthony Rodriguez, Arts Coordinator at 212-941-9090 ext. 3320.